The company was founded in 1971 , The company mainly manufacture hardware tools ,mechanical part and forged parts. The effect of cooperating with different customers has open our company to other market areas in which we started to produce automobile parts, motorcycle parts. In order to lower costs, we started to use the closed-die-processing in order to produce parts and accessories. As a result of our new we production method we could improve the product’s tolerance and surface treatment. Our main products are automobile/motorcycle/metallic parts, mechanical parts and accessories, watercraft/lawnmower parts, precision gears, slide blocks, transmission/drive shafts, crankshafts, balance shafts, connecting rods etc. we have experience with different materials as: carbon steel, alloy steel and stainless steel . To insure product quality, we got the ISO 9001:2000-certified in 2003. In 2008 we moved to a bigger factory at Wufong District in Taichung because of business strategy, market requirement and to meet international standards. We could also increase our productivity with larger pressing and forging machines. We had maximize our capacity to million parts per month, and forging parts weight from 100g to 15kg . We also improved mold design /manufacture and from manufacture only forge parts to finish parts. 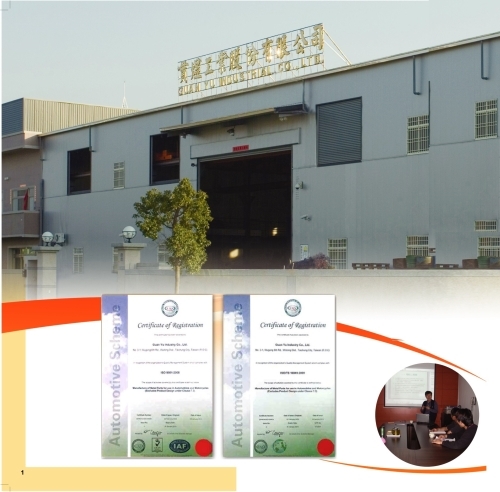 In 2009 our factory received TS 16949-certified. Upgrading facilities and know-how steadily, we focus on offer customer better services. With market requirement, we imported testing instruments as optical projector, Rockwell hardness tester, 3D Measuring Machine, eddy current tester, magnetic-particle testing machine , infrared thermometer and Optical Spectrometer. Our final purpose is offering good product quality and service. Welcome to make OEM and ODM orders.